Total or partial tooth loss impacts your health and lifestyle. Full or partial dentures can restore your tooth function and appearance. And you have the choice of a fixed or removable solution. Your tooth loss condition will determine the type of denture that’s best. Dentures can restore your tooth function in the upper and/or lower arch of your mouth according to where your teeth are missing. A thorough dental examination helps assess the overall condition of your jawbone and gums and the impact of tooth loss on your tissue. Healthy and stable teeth, bone, and gums are essential to beginning tooth replacement with dentures. The loss of all your teeth has a significant impact on your oral health and your ability to eat, chew, and smile. Full dentures replace your missing teeth and restore function in the upper and/or lower portions of your mouth. Your removable full denture is secured to your gums and jawbone by natural suction. A denture adhesive can be used as well. 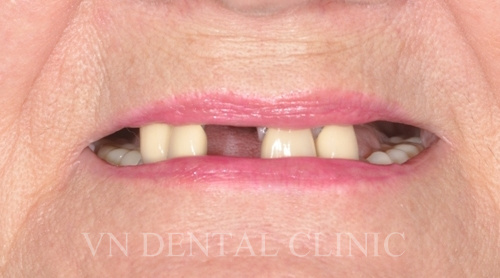 A fixed option is also available for your full denture. Dental implants can be placed at strategic locations in your jawbone if you have adequate bone tissue available. If necessary, a bone graft can solve the problem of bone loss for implant placement to secure your denture. The loss of some but not all of your teeth creates a gap. A partial denture can fill your missing tooth gap and restore your ability to chew and smile. Your partial denture is removable and uses your surrounding, healthy teeth for support. The treatment helps prevent your teeth from moving out of alignment as it fills your tooth gap. Contact VN Dental Clinic and Dr. Van about your tooth loss. 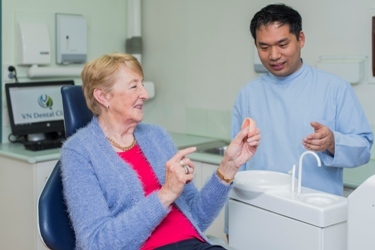 Schedule an examination and consultation to discuss your tooth replacement options including a full or partial denture. We only use quality dental labs in Melbourne who construct your dentures exclusively in Australia. Missing or damaged teeth affect your smile confidence. 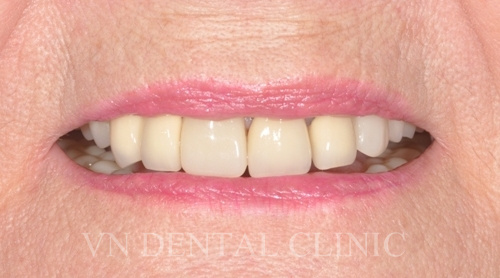 This woman received an affordable and fast smile restoration in less than two weeks with an acrylic partial denture.